Figure 1. 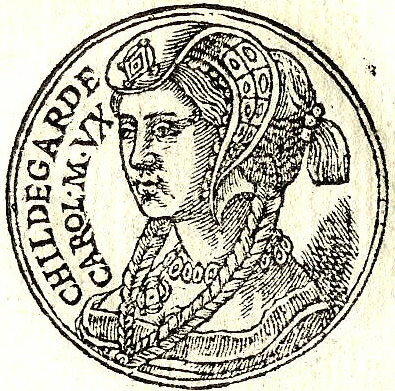 Hildegard, wife of Charlemagne. Demonstrating women's artistocratic dress at the time. Wikipedia contributors. "Hildegard of Vinzgouw." Wikipedia, The Free Encyclopedia. Wikipedia, The Free Encyclopedia, 17 Jan. 2012. Web. 23 Apr. 2012. Two women play small, but significant roles in The Song of Roland: Aude, Oliver’s sister and Roland’s fiance, and Bramimunde, the wife of the Saracen King. Aude is mentioned on only a few occasions. We first hear her mentioned by Oliver when he is angry with Roland for his brash behavior. In stanza CXXX he criticizes Roland and says that he will not be able to marry her if he continues (The Song of Roland 53). Though Aude is not physically present, her role here is significant. In fact, “it is not an exaggeration, within this context, to equate Aude with royal booty, one of the better prizes of conquest” (Harrison 673). She is as much a part of the glory of war and honorable behavior as anything obtained in battle. After Roland’s death, Charlemagne promises her his son Louis as a husband to make up for her loss, but she again stands as a symbol of Roland’s glory by “honorably” joining him in death. Bramimunde is also only briefly mentioned, but when she is, her character tends to anticipate the eventual downfall of the Saracens to the Christians. After the Saracens have been conquered, she returns to France with Charlemagne and becomes a Christian. It is interesting to note that at the end of the poem, “The bishops agree and hand her over to female sponsors who then perform the actual baptism, giving her the name Juliana…the poet is conscious that Bramimunde is a woman, and the ritual observed is appropriate for a nun, not a male convert” (Harrison 677). Like Aude, she seems to come home as a symbol of conquest, both for the Charlemagne and the Christian cause. There is, unfortunately, no information available about the actual roles played by women during the Battle of Roncesvalles. Their presence within the text does, however, tell us some significant things about the expected and ideal roles of women during the time that the poem was written. For example, “Aude…elects to die rather than contemplate life without Roland – not from romantic regret, however, but in fidelity to a masculine ideal of feminine virtue” (Lewis 260). Just as Roland typifies the ideal of the honorable male, Aude typifies the honorable female. She is totally devoted to her cause, Roland, to the point of giving up her life just as he is totally devoted to Charlemagne. This ideal seems to have been widespread in honor/shame societies as a similar practice called Sati, where a woman would throw herself on her husband’s funeral pyre, was known across India by the 10th century. Bramimunde exemplifies almost the same ideal of feminine virtue by converting to Christianity at the end of the poem and joining a strict religious order after the death of her husband (The Song of Roland 119). Harrison, Ann Tukey. “Aude and Bramimunde: Their Importance in the Canson de Roland.” The French Review 54.5 (1981): 672-679. Web. Lewis, David Levering. God’s Crucible: Islam and the Making of Europe, 570 – 1215. New York: W.W. Norton & Co. Inc., 2008. Print. The Song of Roland. Trans. W.S. Merwin. New York: Modern Library, 2001. Print. Wikipedia contributors. “Sati (practice).” Wikipedia, The Free Encyclopedia. Wikipedia, The Free Encyclopedia, 13 Apr. 2012. Web. 23 Apr. 2012.